On busy weeknights it can be tempting to skip making dinner and order out instead. Don’t! Not only is it expensive, but it isn’t healthy for you either. Instead turn to easy weeknight dinner ideas to quickly get a delicious dinner on the table. I love easy shrimp recipes because shrimp is one of those proteins that cooks very quick. 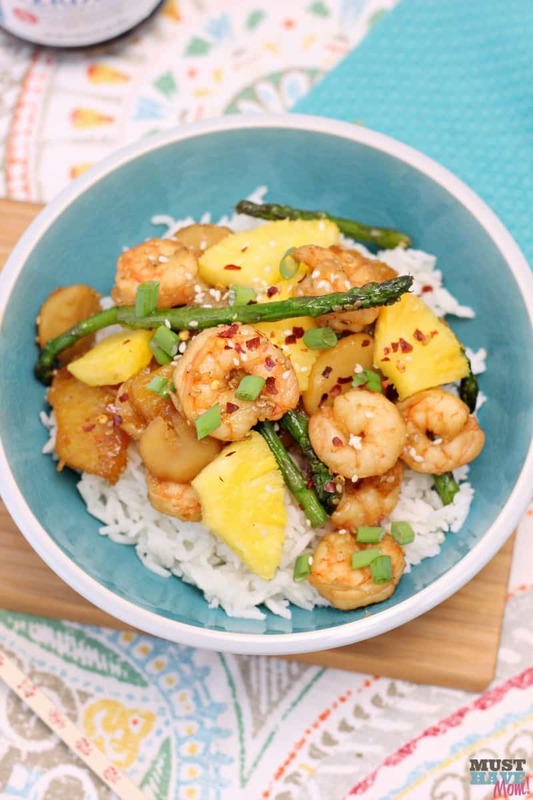 These pineapple teriyaki shrimp rice bowls are ready and on the table in 20 minutes or less. They are so fresh and tasty too! When it comes to easy shrimp recipes I love how versatile shrimp is. From spicy shrimp and pepper pasta to paella on the grill, you can use it in a number of different flavor profiles. Today I am using it in a yummy rice bowl recipe combining teriyaki and pineapple for a flavor explosion! This recipe is made quick and easy thanks to my secret ingredient. 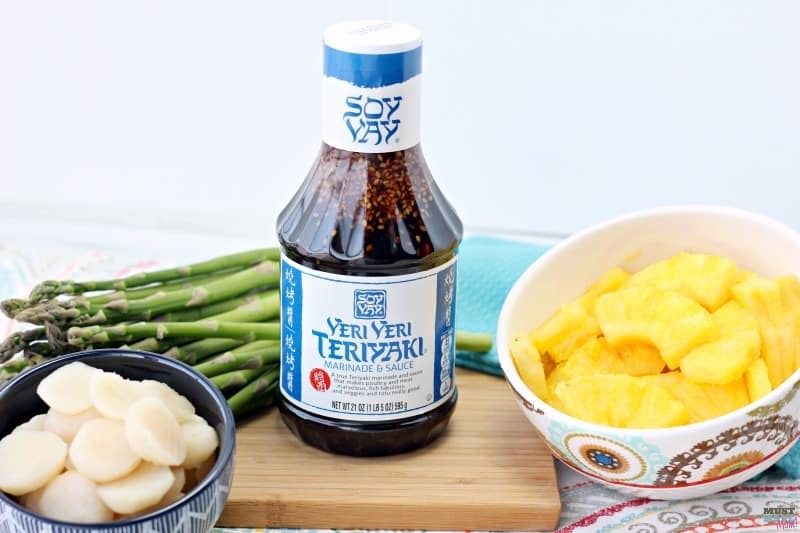 Grab a bottle of Soy Vay Veri Veri Teriyaki marinade and sauce from Target (near the ethnic foods) and it takes all the work out of dinner! Thanks to this pre-made sauce you’ll be able to toss it with your fresh ingredients and have dinner on the table in a hurry. Don’t worry, there are no preservatives or additives in this sauce so you can feel good about serving it to your family. Make sure you Save 20% with the Target Cartwheel app! In a large skillet heat 1 tablespoon coconut oil over medium high heat. Add 1# shrimp and cook until they just start turning pink. Add fresh pineapple, asparagus, water chestnuts and 3/4 bottle of Soy Vay Veri Veri Teriyaki sauce. Continue cooking over medium heat for 5-6 minutes until sauce is thick and bubbly and pineapple and asparagus are tender. Serve over your choice rice. We used basmati rice which was super delicious. 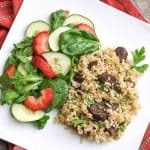 You can also use brown rice or plain white rice. You can also add some crushed red pepper and green onions to the top to give it an added kick if you like a little spice! 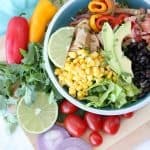 The best thing about this recipe is that it takes less than 20 minutes to have a healthy meal on the table. The rice bowls are bursting with fresh flavors thanks to the juicy pineapple and fresh asparagus. 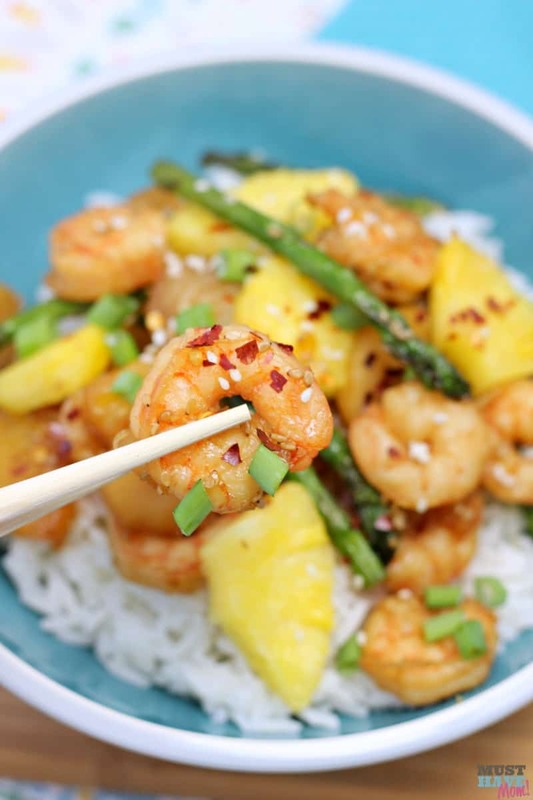 Combined with the teriyaki flavor, the shrimp and pineapple pair beautifully. I love the added flavor that the basmati rice gives it as well. Add a little fun to your weeknight dinner and whip out the chopsticks! Your kids will have fun trying to pick up their shrimp with chopsticks. Make your rice a little stickier than usual to make it easier for them to pick up! 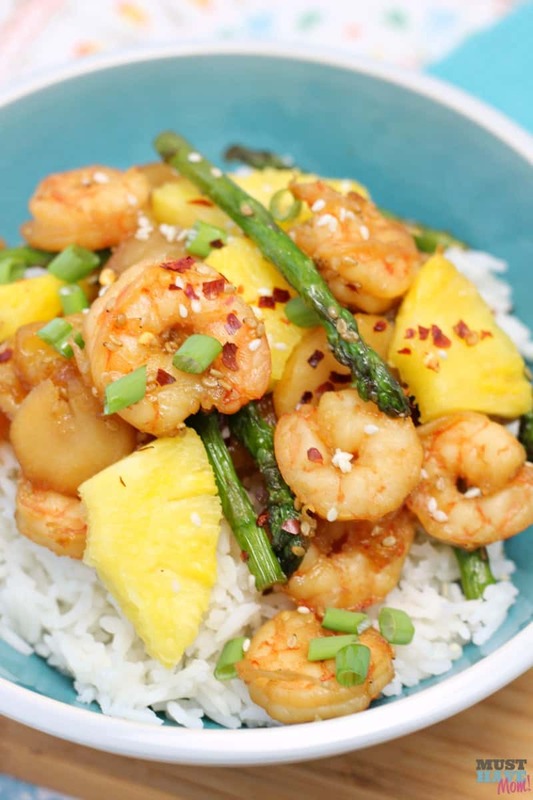 When it comes to easy shrimp recipes this one takes the cake! It’s quick, it’s easy, it’s fresh and bursting with flavor. Print off the recipe below and be sure to pin it for easy finding later. Quick and easy shrimp recipe that is ready in under 20 minutes. 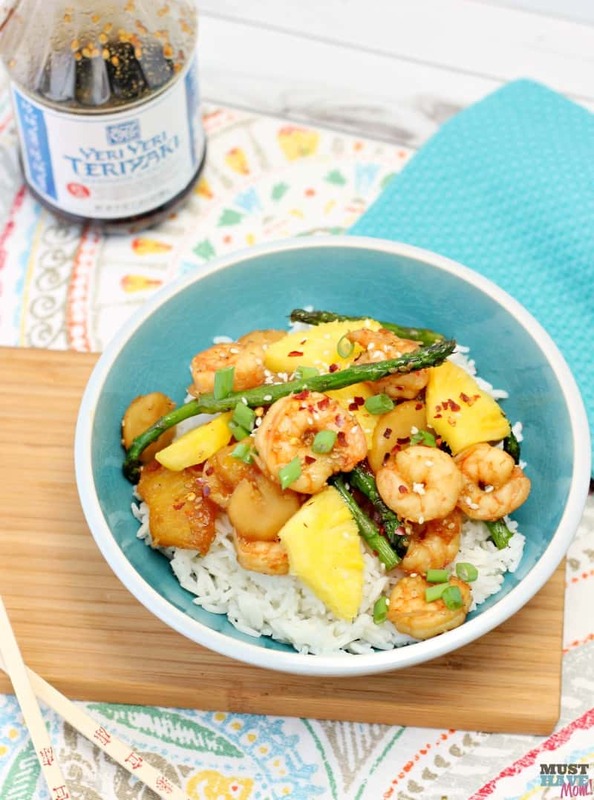 Bursting with fresh flavors and the perfect pairing of shrimp and pineapple covered in a teriyaki sauce. In a large skillet heat coconut oil over medium high heat. Add shrimp and cook until just starting to turn pink. 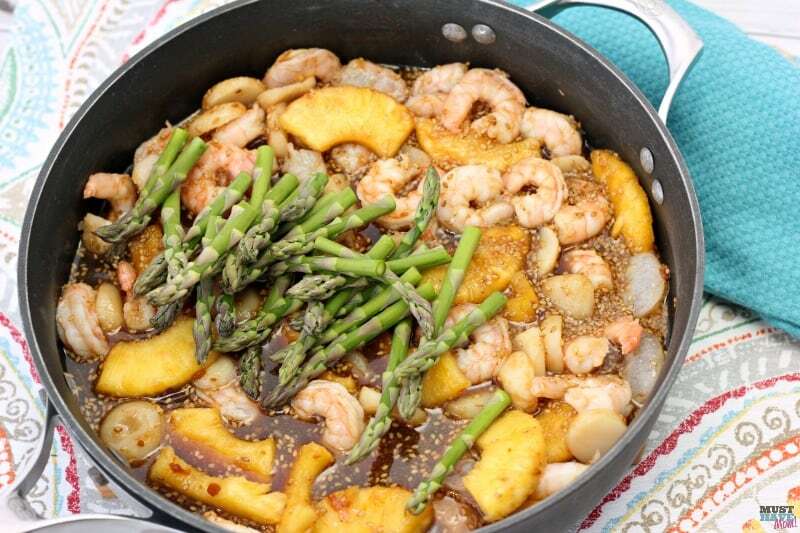 Add water chestnuts, asparagus tips, pineapple and 3/4 bottle Veri Veri Teriyaki sauce and continue cooking over medium heat for 5-6 minutes until sauce is hot and bubbly and pineapple and asparagus is tender. Serve hot over basmati, brown or white rice in bowls. You may add crushed red pepper and green onions to the top for an added kick of flavor. I love shrimp and all these recipes sound delicious. I especially love the shrimp rice bowl. Thank you for sharing. My family loves rice bowls, especially with shrimp! I love the pineapple in this one! What a great looking recipe. The family likes shrimp and would love this. 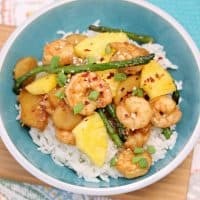 I love teriyaki and pineapple and how easy this is to make. This looks so good! I know my kids would rather have a dish like this than go out to eat. Plus I love that you used asparagus! Oh my gosh this looks heavenly! I love them miss anything that has pineapple involved. I can’t wait to try this! I’m so ready for the rainy weather to be done, and have spring and summer come around. Pineapple always makes me feel like I’m on vacation. This shrimp recipe will tide me over until the warm weather is here for good! I discovered Soy Vay not too long ago and I love using it in my recipes! This bowl looks amazing and I cant wait to try it. Yum! I love shrimp and this looks delicious! I am going to try your recipe. I’m so super picky when it comes to shrimp, but this looks so darn good! I bet my kids would even love it! Rice bowls are always a delicious meal. I will have to give this recipe a try on the weekend. My wife is craving to a shrimp and I’m still finding a perfect recipe to surprise her. I think this would be perfect. The recipe looks absolutely amazing. I am hosting a blog party next month about dinners you can prep in under 30 minutes. 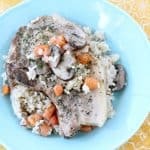 Can I feature this recipe? 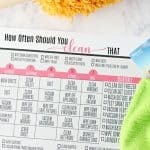 I’ll promote your blog and twitter handle as well! Thank you! Absolutely, you can feature this recipe. You can use one photo, with a link back to my blog.